Seafolly "Inka" striped singlet-style tankini swim top. For in-store inquiries, use sku #2466768. Jonathan Simkhai velvet bikini top. 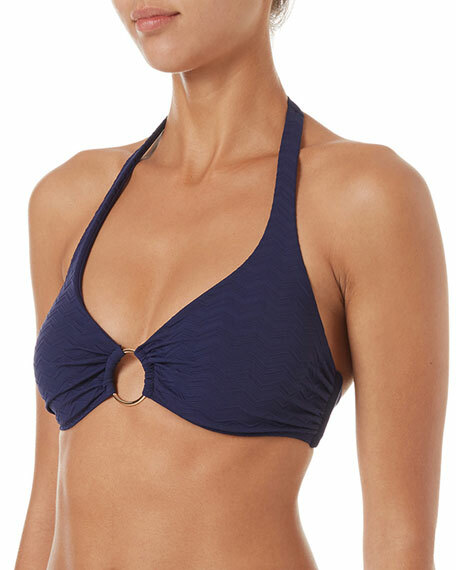 Bandeau neckline; twisted front. Clasps at mid-back. Polyester/spandex. Nylon/spandex lining. Imported. Model's measurements: Height 5'8"/173cm, bust 32"/81cm, waist 24"/61cm, hips 34"/86cm, dress size US 2.